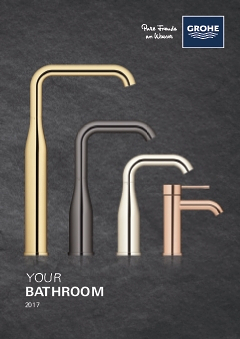 Crafted with GROHE Eurocube’s unique fusion of sharp modern design and luxurious performance, this water-saving single-lever mixer makes a stunning addition to your bathroom and offers a variety of cutting edge functional features. Water temperature and volume are easy to control with a lever that moves smoothly thanks to our GROHE SilkMove ceramic cartridge. The patented EcoJoy system means you can enjoy an impressive water flow even though usage is automatically reduced by up to 50 per cent. Finished in our dazzling and scratch resistant GROHE StarLight chrome, it has a sparkle that will last for many years. Even after frequent use, limescale deposits on the spout are no issue thanks to our flexible silicone SpeedClean nozzles. The GROHE QuickFix Plus system even ensures a quick and hassle-free installation. With its classy, understated design and functional perfection, this tap will add style and convenience your bathroom. An easy yet sophisticated upgrade!